Best kept in species tanks or with top-swimming fast fish. Will be aggressive towards smaller fish that linger near the substrate. Will attack any invertebrates. May leave top-dwelling fast-swimming fish alone, but risky. This species of fish will eat frozen food (if trained to), live foods, prawn, and krill. Gut loaded Ghost Shrimp will work as well. Feed once or twice a day when young, every two to three days when adult. Sandy substrate at least as deep as the length of their body, and planting is appreciated. Likes to rest on top of driftwood. Sensitive to water quality issues, regular water changes are a must. They are quite messy fish so excellent filtration is a must. Very aggressive toward live fish but the Congo Puffer is a slow fish. Spending most of its time in the sand or just resting on the bottom. They will bite your finger when cutting back plants in the tank, mine did and it made me bleed..little git! But they are great fish to keep. 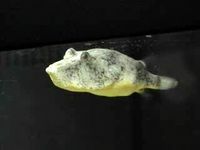 The Congo Puffer comes in several colours, red, yellow, grey almost a whitish colour, and brown. Eyes are place almost directly on top of its head and mouth is wide with it pointing upward. Tail fin is normally closed will its belly being flat.